So I’m guessing that you’re here to find out How to Soundproof a Home Office and that won’t break the bank in the process of doing so! When I started working from home a couple of years ago, the sound quickly became an issue with my three young boys playing in the other room. Since then we’ve moved once, and I’ve learned from the last house how to better soundproof my home office. Each soundproofing project is unique, but most home offices can be efficiently soundproofed for just a few hundred dollars if you’re smart about it. Before I begin, a CRITICAL tip that will likely save you tons of money on this project is understanding the difference between sound deadening and sound blocking! Hollow Core or Solid Core Door? Step 8 – Ever Try Noise Cancelling Headphones? Conclusion On your DIY Soundproofing Project! The difference between sound deadening and sound blocking, for example, suppose you have three noisy boys in a room adjacent to your office; You want your office to be quieter, so you purchase sound deadening curtains to put over the windows, you know those pointed foam panels like you see in recording studios. Unfortunately, you could spend over a thousand dollars on those purchases, and it will do very little to soundproof your office. Those products help with sound deadening by preventing noises from echoing around the room. However, they will not be sufficient for keeping different types of sound from outside the room from entering. Sound blocking products will help to prevent any types of sound from entering the room at all. Sound blocking requires thickness to be most effective. This is why it’s much easier to build a home office and make it soundproof than it is to sound block an existing home office. If you’re building a house, you can have the builder merely use sound blocking drywall or soundboard to prevent sound from entering the room. If you are trying to cut out sound from outside the home, then a new soundproof window can fix many issues for just a few hundred dollars installed. And now we can tackle The most substantial “big rectangular hole” in your office which is unquestionably the door! The door is almost certainly the biggest problem in your home office. There are several steps you can take to soundproof the door or doors if you’re in that unlucky soundproofing predicament. The least expensive and quickest way to soundproof your door is to get an inexpensive soundproof weatherstrip (like this one on Amazon) to put under and around the door. I like the type of soundproof weather strip that is equipped with adhesive so you can just unwrap it and stick it to the door jam. That will at least stop sound from going straight into your office. You can have a thick door made of solid steel; it won’t make much of a difference regarding sound barriers if you have a massive crack at the bottom of your thick door! If you have carpet under your home office door, then you’ll also need a draft stopper. A draft stopper will glide across the bottom of the carpet and provide soundproofing. So you’ll use the adhesive strip around the top of the door and the door jam, and the door sweep on the bottom of the door. 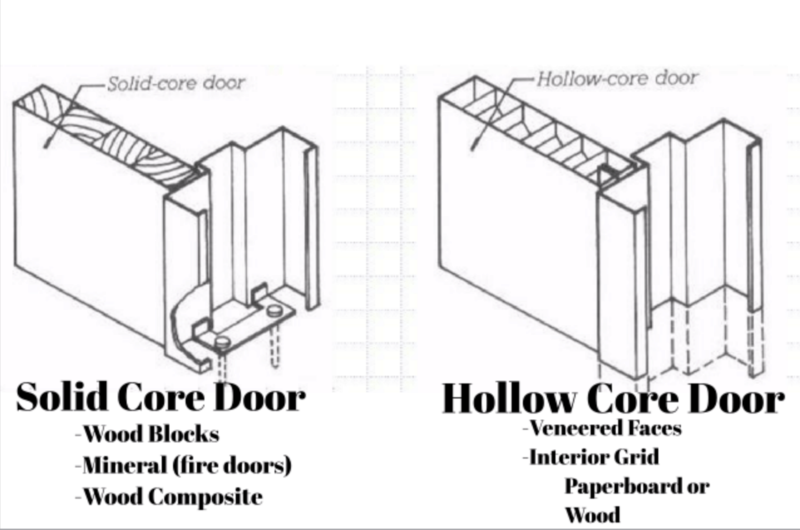 Difference between Solid core door and Hollow core door. Next, consider changing out your door for a solid-core door. Go up to your door and knock on it. If it sounds heavy and thick like a chunk of wood, then you have a solid-core door. All exterior doors will be solid core. Doors that lead to another interior room of the house are almost always hollow-core doors, which do little for soundproofing. If you have a hollow-core interior door leading to your home office or worse a glass garden style door; consider heading to Lowe’s or Home Depot and buying a stable core door for $99 and paying a handyman $75 to install it isn’t a bad idea. That’s undoubtedly a Quick fix, but you’ll still want to put on the adhesive soundproof weather strip I mentioned earlier. In one of my co-workers home office, he simply installed a second door. I was a little perplexed when he told me that, but I saw it for myself. He just had a handyman build a second door to his home office. Now you have to open and go through two doors get into his home office. This made a DRAMATIC improvement in the quietness of his office. This may not work in all homes, but if your layout works and the size of the door frame allows space for having two doors, then it’s something I recommend. Another option if you don’t want to buy or can’t afford a brand new solid core door is to get a soundproofing blanket and hang it on back of the door. Soundproof blankets can be as useful as a solid core door and cost much less. Also, you may want to consider looking around at some places where they sell used doors and home building supplies for cheap; you might find what you’re looking for and only have to add some paint to make it look good. If you have followed all the steps in phase one and you’re still having trouble with sound coming into the room, then the chances are that you have structural soundproofing issues. In my previous house, my home office was directly above the garage. We were living in a split entry home at the time. When my wife would come home using the garage door opener, It made the typical garage door opening sound. It was a loud, low grinding sound. Since the garage door opener was mounted to the ceiling downstairs, the vibrations were sent through the studs directly into my home office. Experts call this structural sound. The only way to stop structural sound is by using isolation techniques. This means separating layers of your wall so the vibrations of sound can be dampened, and not passed to another layer. So the way you’d do this is by hiring a handyman to install a second layer of drywall on all of the walls of your office. This pushes in the room by one inch, and I’m telling you, you won’t even notice the difference after the drywall is installed; it will dramatically reduce the level of sound–especially low frequencies like traffic or structural sound. 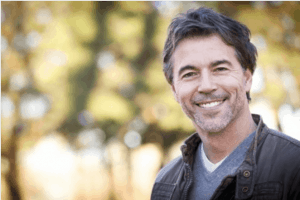 When your handyman comes, you’ll need to have a sound channel and sound clips available that he’ll install between the layers of drywall to stop the sound. Acoustic Panels for Home Office Soundproofing. The last thing you can do will probably make the smallest difference concerning actually dropping the decibel level in your home office, but it can make the sounds that do come in be less annoying by stopping the echo. First, decide how much of an issue your room has regarding echoes. Walk into the room and shut the door and yell something as loud as you can. Listen for the remarkably short echo after screaming to see how much vibration is happening within the interior of the office. Think, for every single sound that comes into your office, that sound is reverberating for another 1/4 second or so. Preventing echo won’t make the room quieter, but it will make any echoing sound much less annoying. So that’s mainly why anyone would want to control and reduce as much echo as possible. Fortunately, stopping the echo is very simple. First of all, look to your floors. If you have tile, wood, or another hard-surface flooring, this will dramatically increase echo. The solution is simple, go off and buy a big and thick plush rug and lay it on the floor, new look, no echo! Next, look to your walls. If your room has facing walls as all square or rectangle rooms do, softening sound on the walls can help. Put up curtains to keep noise from bouncing off windows. Put up a large canvas gallery artwork on the wall with some foam behind to soak up the sound bouncing on the walls. The key is adding as much thick, soft materials around the room as possible to make your soundproofing as effective as possible. If you don’t think preventing echo is essential, go to your washroom. The washroom probably is the room with the highest echo. Turn on some music from your phone, and you’ll know exactly what I mean. It’s hard to make out the words because the music is echoing so much inside the room. Then keep the music playing on your phone and walk into the closet where there are lots of clothes hanging on the walls. The soft material from the clothes soaks up all the echo and makes the room feel so much quieter. Have you ever hear of soundproof paint? Well, it does exist and would contribute to sound absorption and noise blocking of up to 30%. The soundproof paint that I’ve worked with in the past is called Acousti-Coat (Amazon). Acousti-Coat is a water-based injected with microspheres and sound absorbing fillers. The soft pigment fillers absorb sound and help to prevent it from bouncing off the walls and ceiling. Noise in the 500Hz range is reduced by 30%. 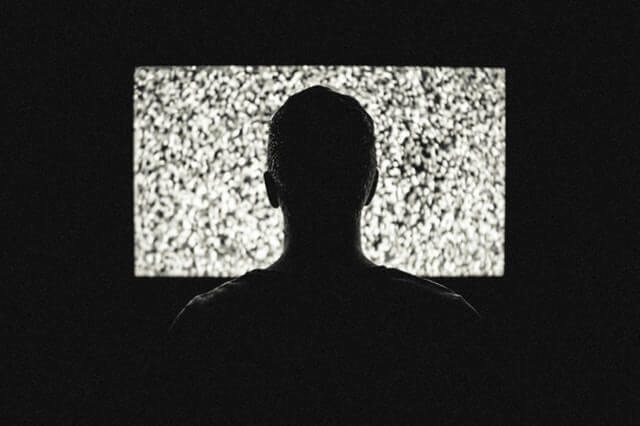 500Hz is the mid-frequency of the human voice. Soundproof paint is a relatively inexpensive way to help reduce the transfer of noise while you’re trying to soundproof a home office. The soundproof paint will especially help on the ceiling where you have people above you walking around and talking. It will also help eliminate the tin noise of a metal roof from transferring down through the structure of the house. I bet you never thought of soundproofing the air vents, have you? Well, soundproofing the air vents in any room is commonly overlooked; unless there is noticeable noise coming from the vent itself. Aside from the doors and windows, the air vent would typically be the biggest hole in any room. The most significant difference however between the doors and widows versus the air vent is that the air vent is open while the others are not. There are a few ways to soundproof an air vent. You can either block it off entirely and paint over; if it’s just an overhead door air vent going from room to room. Or you can also replace the vent cover with a vent silencer. 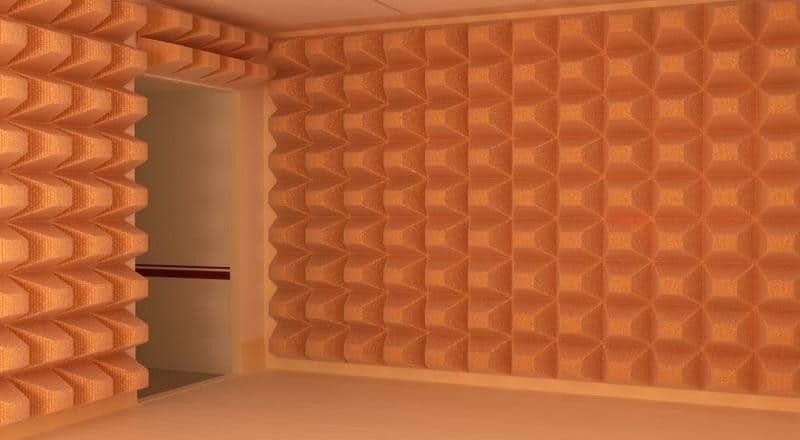 The third option to make an air vent quieter would be to build a sound maze inside the vent. An air maze (image below) will significantly help reduce the transfer of sound waves but will not block the flow of air coming in from another room. If you’re dealing with an air vent attached to a heating or cooling system there are ways to make a bit quieter if you’re having issues with noise. The most common noise coming from an air duct would be a vibration noise while the air is pushing through the grill. Either the metal-air shaft is vibrating, or the grill itself is making a vibrational noise. Either way, stick a few strips of sound absorption tape directly on the air shaft. The tape should reduce the vibration reasonably quickly. See our full guide on how to soundproof an above door air vent! Making the Outdoors your Home Office. I know for myself, living with three small boys can get very loud at times inside my home. Something I often wonder is if I should take my office outside. If you can’t win, might as well leave. Usually, I would move my office during the summer months and work outside on the back deck. If you have space, you can run off to have some quiet time then that might not be such a bad idea. 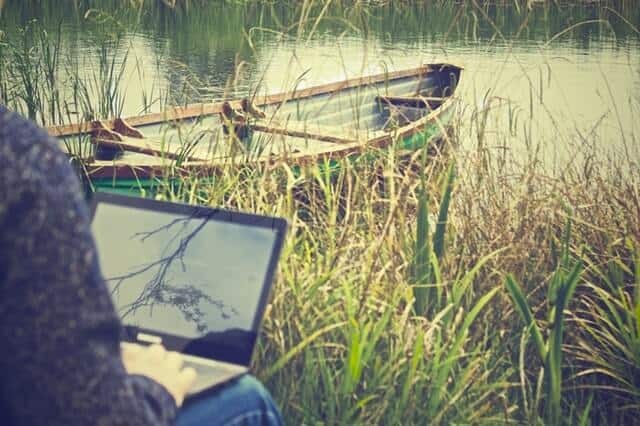 Going outside could work if the noise coming into your home office is not occurring every day. If the noise is constant and you don’t have the means in the short term to renovate your home office perhaps try another room in the house. I for one find the garage the quietest place in the house when my kids are terrorizing the inside of my home. Most people like myself do not require much these days regarding a home office. I like to work on a desktop computer if I am working on larger projects; but most of the time all I need is my laptop and an internet connection, oh and a chair. A local coffee shop also works because I find the noise of people talking in the background eventually turns into white noise. Use a white noise machine for the home office. If you can’t move to another area like I was mentioning above, and you’re forever stuck attempting to soundproof your home office, then there are things you can do to help drown out some of the noise. Let us imagine that you’ve done at least some things on this list regarding soundproofing a home office, and you still hear some noise; try a white noise machine. If you can still hear the background noise, then a white noise machine could help in your effort to make your home office more peaceful. A white noise machine works by creating a constant noise. Unlike a thunderstorm or waves crashing on the shore which is not constant, white noise is more in line with the sound from a fan. A fan emits a constant noise while a lightning storm creates jarring noises when lighting strikes. The white noise machine I always recommend is the Marpac Dohm All Naturel White Sound Machine (Amazon). The reason why I like this particular system above its competitors is that this one uses a fan inside the machine to make the noise. There is a cover so you’re not bombarded with cool air of course. Almost all of the other types white noise machines makes sounds that come out of a speaker. You might as well download an app if you’re going to go that route. Have you ever tried a pair of noise-canceling headphones? I have, and I really like it when I want to drown out the background noise while trying to listen to a podcast. If you’ve soundproofed enough of your home office but you can still hear a nagging sound that is constant then slapping on a pair of noise-canceling headphones would be an easy fix. The only catch with these types of headphones is that the noise needs to be a “constant background noise”. That means that if the background noise is coming from brawling kids, then these headphones won’t work. One question I was asking myself before I began looking into noise canceling technology is if I had to listen to something for the noise canceling to work as intended. I was happy to hear that no, you don’t need any music. All you need is to turn them on and make sure the noise canceling feature is also turned on, and you’re good to go. The ones I use and also recommend are the Sony WH-CH700N (Amazon). They might not be an Amazon bestseller but those are the ones I actually have and I’m pleased with them. Try to buy them when they come on sale. If you are having problems with stomping noises coming from above your home office, there are ways to go about correcting this problem. There are a few ways to go about soundproofing a ceiling inside your home. The most common way to go about this is adding some 5/8″ sound absorbing drywall along with some Green Glue (My review). One of the ways that I find works best when soundproofing an existing ceiling is by adding a resilient channel between the ceiling and the new sheet of drywall. A resilient channel is a type of construction material that is used to reduce the transmission of sound through walls and ceilings. As you probably already know, sound waves travel much easier through solid objects. Think of when you were a kid, and you would press your ear on the rail of a railroad track to hear if there is a train coming, same concept. 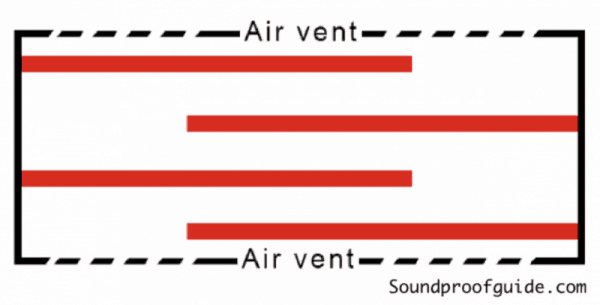 So since sound travels better through solid objects you have to create an air cavity, hence the resilient channel. The resilient channel consists of sheet metal studs that are used as a barrier between the ceiling and the building framing. Since you already have an existing ceiling, all you need to do is add the resilient channel and then add some drywall over creating a second ceiling. You shouldn’t feel the room become any smaller by doing this. The gap left by the resilient channel will muffle out the noise coming from upstairs leaving your home office much quieter. Here is a link to our article on how to soundproof a basement ceiling. The same process would apply as soundproofing your basement ceiling as your home office ceiling. We demonstrate different examples of how to get the job done right. Sometimes the biggest downfall of any projects, be it major or minor, is the lack of planning that went on before the job started. Before you do anything, write down on a piece of paper exactly what noises are the ones you want to eliminate and where they are coming from. If the noise is coming exclusively from outside, then focus on the exterior wall and window. There is no need just yet to attempt to soundproof your office door if you’re worried about barking dogs or outside traffic. All I’m saying is soundproofing a room in your home does not have to be terribly costly or complicated. All you need to do is figure out where the culprit is and fix it and stop worrying about soundproofing anything else in your home office. Working from Home is a blessing! I entirely love not having to commute every day. By following all these steps, my office is now quiet and peaceful. It’s nice to be able to go into my office, shut the door; And have as much privacy and ability to focus on my work as if I were in an actual place of business. I hope this was helpful to you and that you’re successful in knowing how to soundproof a home office in the cheapest way possible! 5/8″ vs 1/2″ Drywall – Best Soundproofing Sheetrock & Wallboard?